The drones have taken up the Gen z by storm, the recent release about the new ones has been the talk of the town! Let's see what they're up to and how different they're from each other. First, even if they are alike in portability, the latter has built-in Camera, the former is designed to work with several GoPRO cameras. Given that, both of these multi-rotors are portable, but how portable are they? The Mavic has the edge! 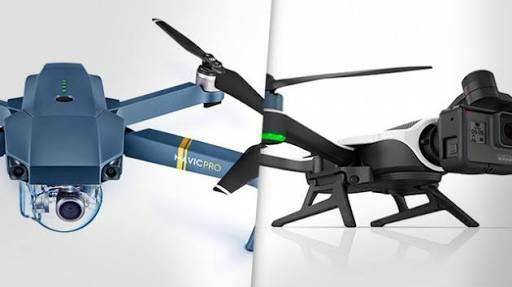 Both of them use a folding design to make them easy to carry around, but Mavic is lighter and folds down as small as a bottle of water! Karma, will however when folded will fit into a backpack, making it much smaller and lighter than the wrongly called drones. Okay, the features! There's the stabilizer which should make for some impressive footage, comes with a 90 degree range of motion and moves on three axes, in both of them.